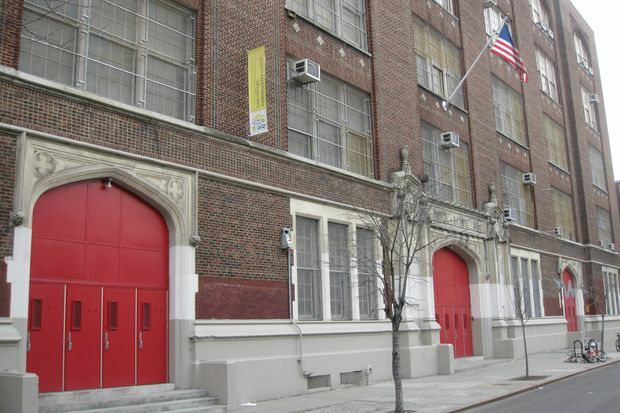 The East Village Community School is located at 610 E. 12th St. in District 1. MANHATTAN — The city is planning to implement a new district-wide admissions policy known as “controlled choice” to integrate students from different socio-economic backgrounds across the 16 elementary schools of the Lower East Side and East Village, Department of Education officials announced Tuesday. The move signals the DOE’s commitment to boosting diversity of the city’s schools, but some question whether the model can be replicated in other neighborhoods — and parents, who spent years fighting for controlled choice, were still not happy and said it did not reflect their own vision on how to integrate their elementary schools. District 1 is unlike most other districts across the city, since it is already a “choice” district where schools do not have neighborhood zones but rather rely on a lottery for admissions. Parents in District 1 have been pushing for a controlled choice model for several years, concerned that families were self-selecting in ways that segregated their schools. Under the proposal, all elementary schools in District 1 (except for the gifted school NEST+m) would give priority to students who qualify for free or reduced lunch, students in temporary housing and English Language Learners for 67 percent of their pre-K and kindergarten seats, Department of Education officials announced Tuesday. That percentage reflects the demographics of those students across the district, said Deputy Chancellor Josh Wallack. “We believe this is a strong plan and a big step forward for us. This is the first time we’ve done anything like this on the district level,” he said. Students who don’t match those criteria will have priority for the remaining 33 percent of offers. All of the principals have signed onto the plan, DOE officials said, noting that they expected to finalize the plan by the first week of October to be ready for the 2018 admissions season. The parent-volunteer Community Education Council was awarded in 2015 a three-year grant under the New York State Department of Education’s Socioeconomic Integration Pilot Program. The grant supported the efforts of parents and school leaders to develop the new admissions model as well as the family resource center. But parents remained skeptical of whether the end goal of diversity could be met and accused the DOE of implementing something that left out many of their suggestions. "How is that going to fulfill the diversity issue in our neighborhood?" said CEC member Lilah Mejia, who said she stopped attending meetings on the plan in March out of frustration. "Black and brown students are not applying to progressive schools... You giving us higher statistics, saying 'We’re definitely going to accept these students,' really doesn't affect diversity." The plan hopes to address these concerns through its launch of a “family resource center” providing enrollment support and education about schools to families to ensure they have the best information to help them make their choices. Wallack was hopeful that the center would help in ways like enrollment specialists have helped families across the city understand their options for pre-K. Currently, roughly 40 percent of families in the district put only one school down on their Kindergarten applications, Wallack said, indicating that families were not really exercising their choice in the district. Wallack, meanwhile, gave the parents credit for pushing the initiative, and wanted their support. “We need them to make this succeed," he said. The clash of ideas between the parents and DOE was so great, that the plan almost crumbled entirely, said Matt Gonzales, director of New York Appleseed’s School Diversity Project, a social justice nonprofit focused on school equity, who sat on a working group for District 1. But he was excited that the DOE was moving forward, and while he acknowledged that the department had not been supportive of the district’s plans in year’s past, it has shown throughout the year to take it seriously, he said. A system with “unfettered” choice, as District 1 had in recent years, means there are “no controls or assurances of equity in the process,” he explained. While choice has potential to help integrate schools, it needs mechanisms to do so, he said. He also credited parents in the district. “Despite frustrations of parent leaders in the district their persistence has paid off and will pay off,” Gonzales said. He was hopeful that other districts could look to District 1 for guidance as they work on diversity plans. David Bloomfield, education professor at Brooklyn College and the CUNY Graduate Center, doubted whether other districts with zoned schools could adopt a similar model. Wallack acknowledged there would be challenges in other districts when it came to looking at zoned elementary schools, but suggested that the model could be a useful example for districts that are looking at diversity plans for middle schools, like in Districts 13, which spans from Brooklyn Heights to Prospect Heights and Clinton Hill, and District 15, which includes Carroll Gardens, Park Slope and Sunset Park. In other area, the city is looking more at rezoning schools to address diversity, he noted. “We have to look district by district and community by community,” he said. He also added that while the city wants to implement the District 1 plan fairly quickly, the DOE wants feedback to help make adjustments moving forward. “We definitely are going to analyze this after year one, but we think this is a strong step forward,” Wallack said.